Even if you aren’t a party animal, on New Year’s Eve it’s much more fun to be in a crowd ringing in the new year. 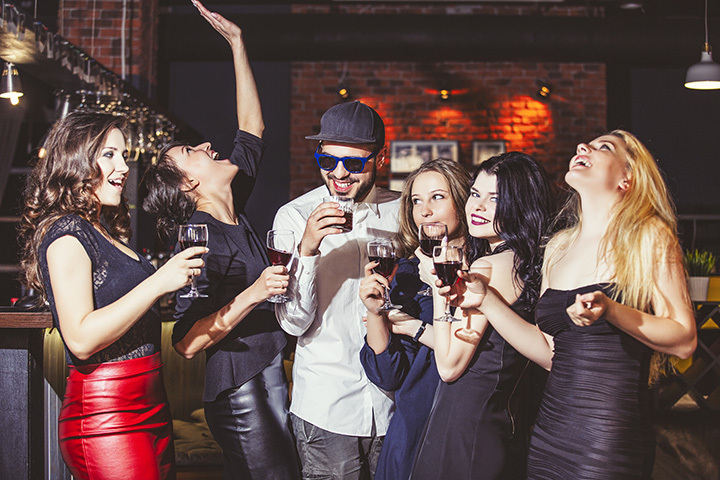 Here are 10 bars around Oklahoma that are hosting parties where you’re sure to have a good time, meet some new friends and enjoy the celebration. The Hitmen, a local band that plays pop, rock, country and R&B, will be the featured musicians on New Year’s Eve. It starts at 8:30 p.m. and goes through 12:30 p.m. There’s no cover and you’ll get a free champagne toast at midnight. Watching my favorite guitar player Steve Pryor on this rainy night in Tulsa. Lickitty Split is hosting this celebration near Grand Lake. You’ll want to make a reservation for this party that starts at 6 p.m. with prime rib dinners. The band starts playing at 9 p.m. There’ll be plenty of drink specials and some giveways. It’s a fairly casual atmosphere, but feel free to dress up in your party clothes. Dinner after a nice day of Golf! There’s no cover for this party starting at 8 p.m. The bar won’t be doing dinner service, just drinks and appetizers. Karaoke begins at 9:30 p.m., and goes until they close. You’ll get a champagne toast at midnight and plenty of party favors. CRÜEligans and Guns of Texas are the bands playing for this party in southeast Oklahoma City. Reservations aren’t required, but there is a $10 cover. The bar provides party favors and champagne toast at midnight. The Drunken Fry is “the best little punk rock hole-n-the-wall bar in the 'barmuda triangle'!” The New Year’s Eve celebration at Drunken Fry will feature three bands, MF Ruckus, Bling Staggers, and one yet to be determined. The show is free. It’s sure to be a great party. Outlaws is generally closed on Sunday nights, but they’re extending their hours this year for a New Year’s Eve bash. Come out and two-step your way into 2018 with great music, good drinks and close friends. You’ll need to get your tickets early to attend this event that features the Robbie McMillan Band. Watch their Facebook page for information. The Boom hosts karaoke on Sundays, and they’re sure to have a special celebration on New Year’s Eve. Typically, they host a dinner theater show that is hilarious. The Okie Tonk might have café in its name, but it serves drinks, dinner and coffee. It’s hosting a party with Life of the Party OKC, a local band that plays a variety of music. It’s one of the biggest parties in Moore. Opolis is hosting a New Year’s Eve Party this year, and make sure to keep up with their website to find out about all of the details! This live music venue knows how to throw a celebration.